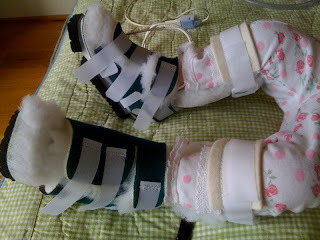 These are Gwendolyn's new AFOs (ankle-foot orthosis); we're calling them her "moon boots":) AFOs are braces that will help keep Gwendolyn's feet at neutral position to, in conjunction with regular physical theraphy, prevent contractures in her ankles. Contractures, which are the shortening of muscles or tendons, can be very common in SMA babies as a result of their lack of movement and can be very painful. Once contractures occur they can't be reversed which is why we are constantly stretching and moving Gwendolyn's joints. The AFOs cover her feet and extend to below her knee. They are made of plastic and aluminum and have a very thick, soft, comfy cozy material inside. Initially we will be putting them on her for about an hour per day when she is awake, but if she tolerates them our plan is to have her wear them when she sleeps at night. So far, she's doing fine with them. We want to thank Visiting Nurse & Hospice Care of Santa Barbara for helping us get these for Gwendolyn. You guys are awesome! Are You An SMA Carrier? Advocating for the Affordable Care Act: Gwendolyn's Story (Video) It Arrived!!! Let the Adventures Begin!